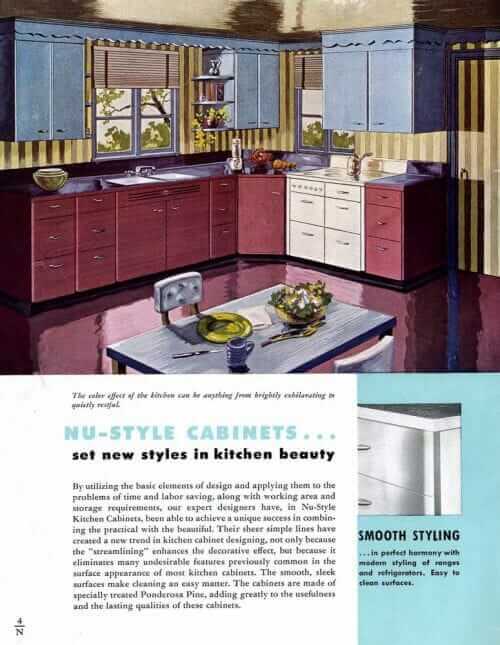 Wood kitchen cabinets were surely more popular than steel kitchen cabinets after World War II. 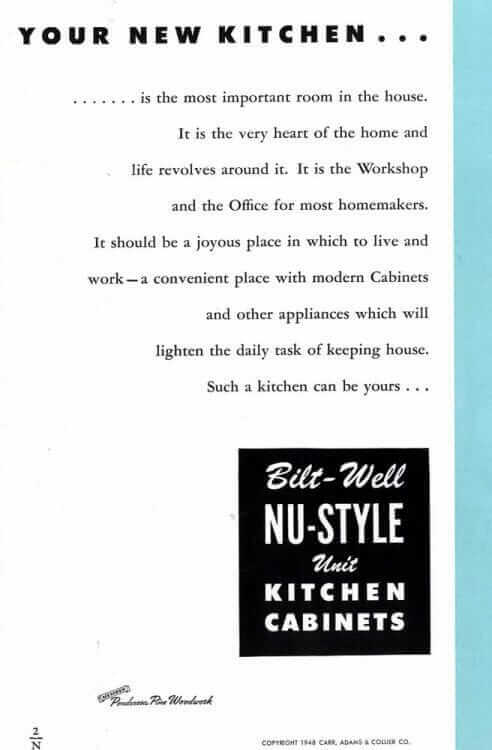 Homemakers were very familiar with the comfort of wood, and although I don’t know this for an academic fact, steel cabinets must have been more expensive. 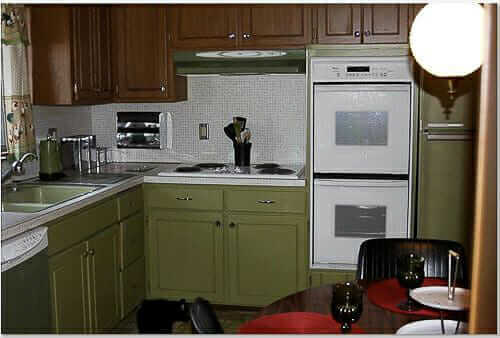 Wood cabinets also other benefits — they are “warm”, dents and fingerprints are less likely to show, and you can repaint them relatively easily. 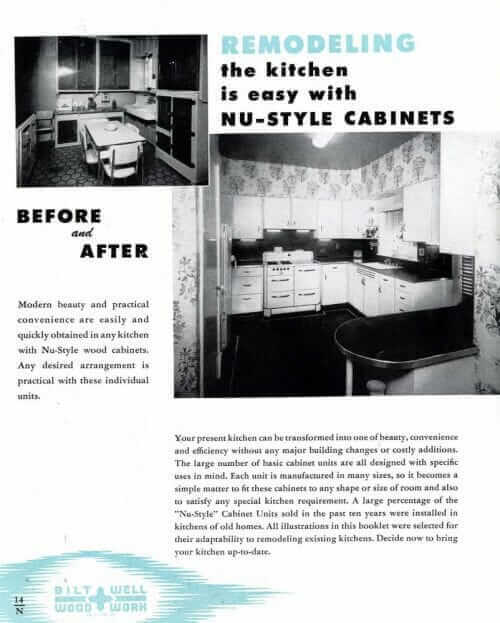 I tend to think that there were many makers of wood kitchen cabinets nationwide, each selling into their locality or region. 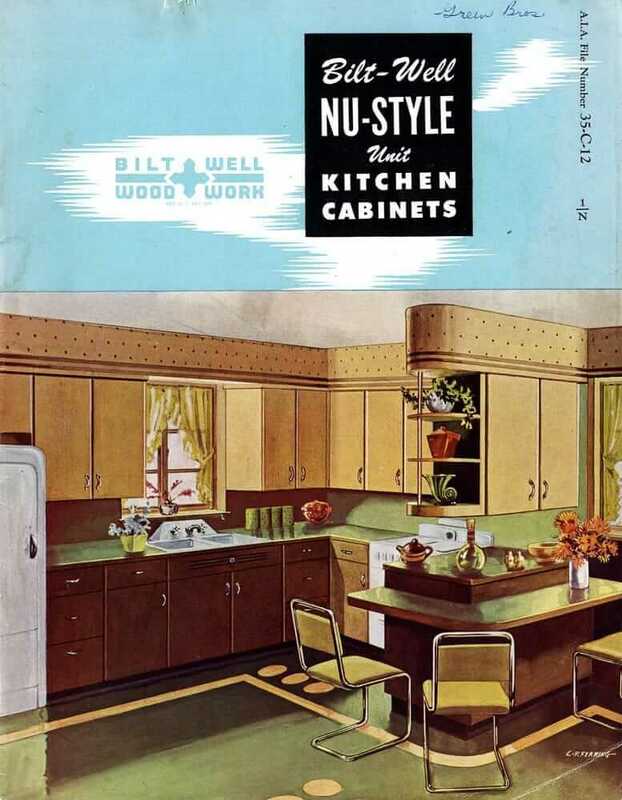 Today for your viewing pleasure: A 1948 catalog from my collection full of stylish kitchens designed with wood kitchen cabinets. 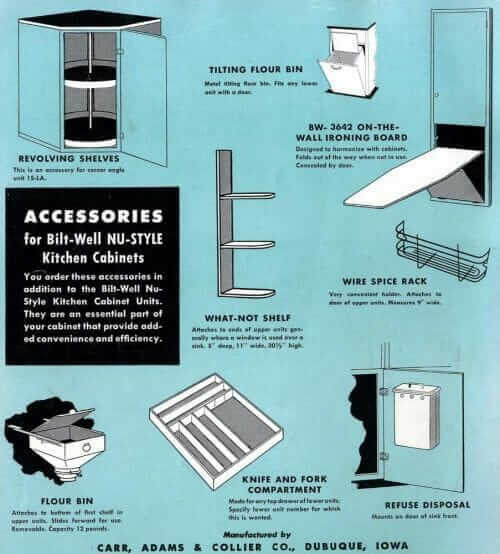 The company is Bilt-Well, manufactured by Carr, Adams & Collier Co. of Dubuque, Iowa. The style is “Nu-Style”. 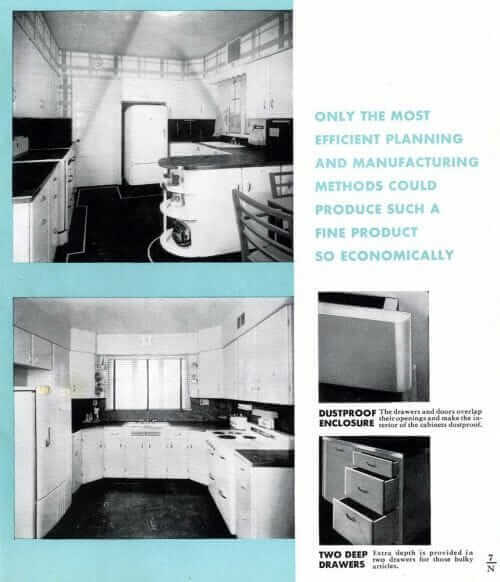 That seems to be: Slab-front, radius-edge door panels and drawer fronts… at close to full overlay. 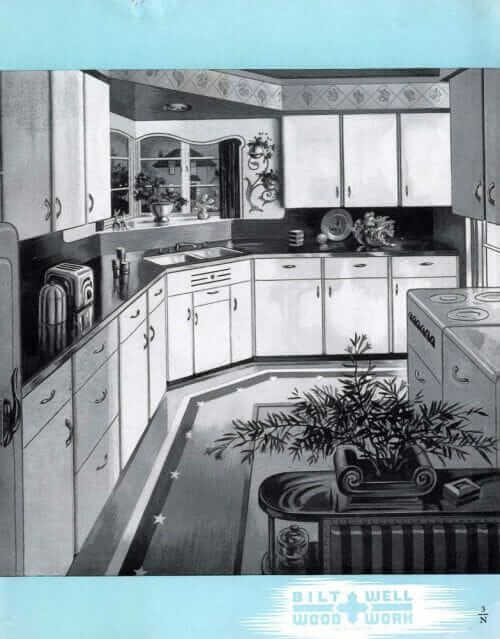 This is very much akin to the design of steel kitchen cabinets. Sleek. Fitted. The year is 1948, so America is still very much in recovery from World War II. 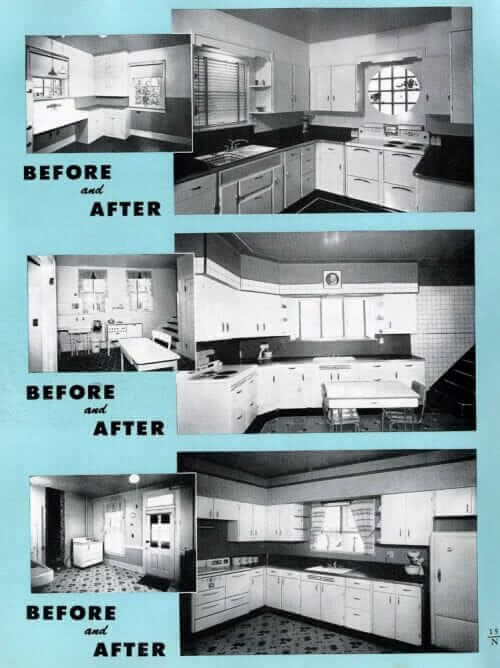 The styling in these kitchens is all very linked to Streamline design that was popular before World War II. 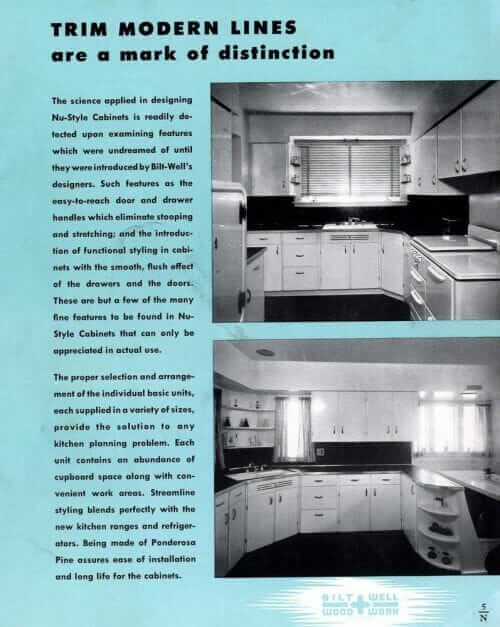 The brochure says the cabinets are made of specially treated Ponderosa Pine. This surprised me. 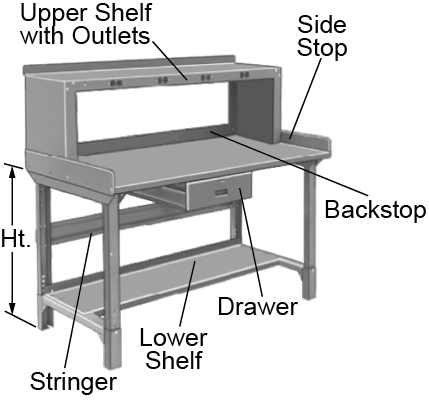 I tended to believe wood kitchen cabinets were usually made of birch or maple. But here you have it: Pine. I wonder if it was “better” pine than we have today. Older-growth pine. ? 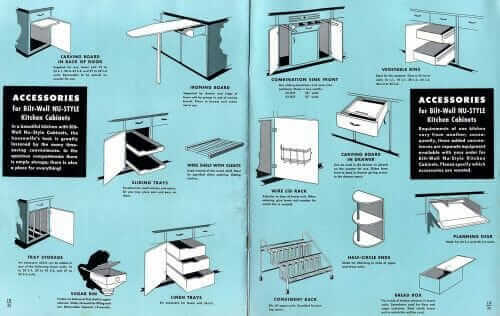 The cabinets are modular, like today. Oooooh, what a pretty color! 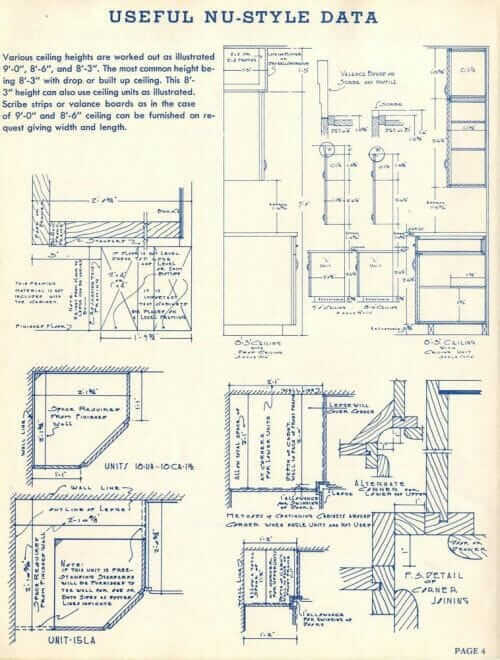 This page says the cabinets are set on a built-up base, so you can raise or lower the counter height to suite. 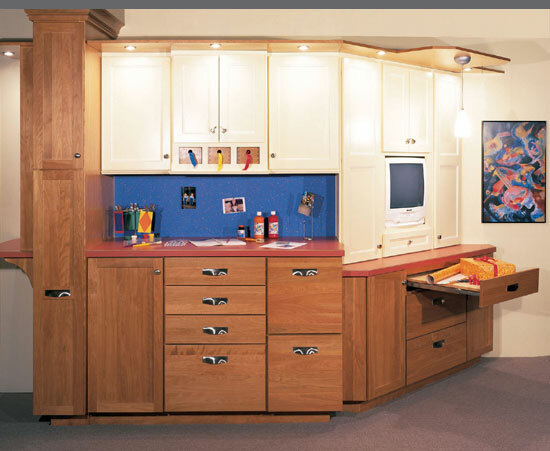 Lots of piece available to maximize every inch of available space. 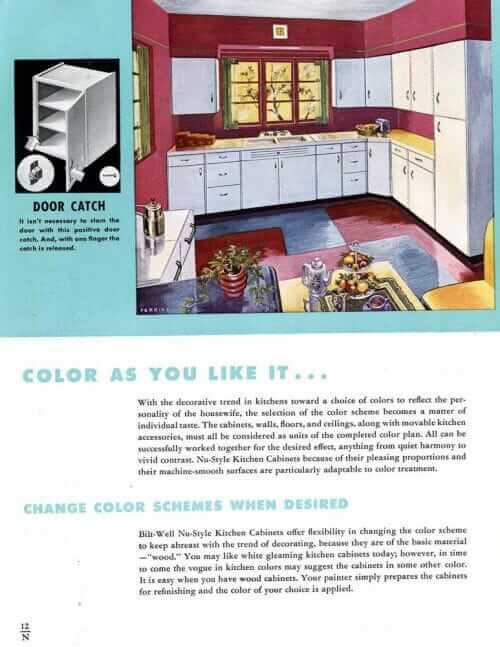 They’re talking up the ability to easily change the color of your cabinets here. 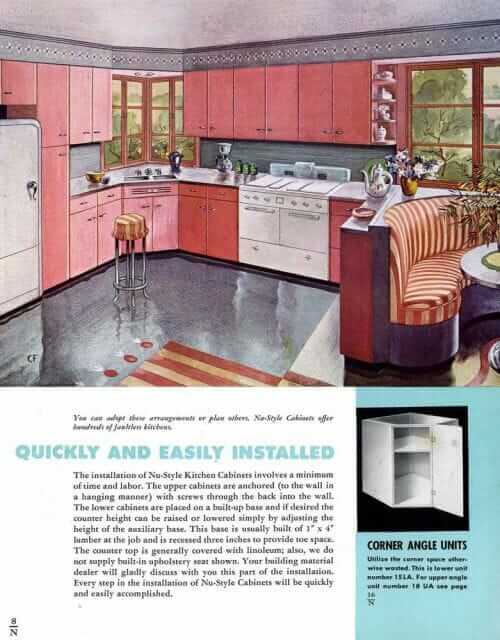 Note: It’s fascinating to see the bold colors of 1948! 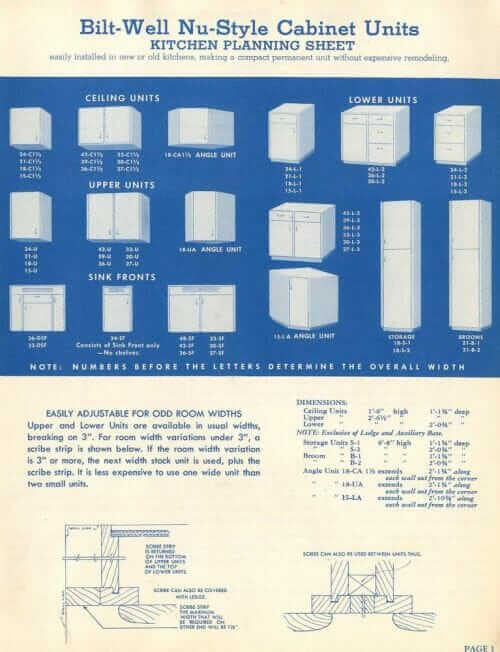 The catalog includes a fair amount of technical info, too. 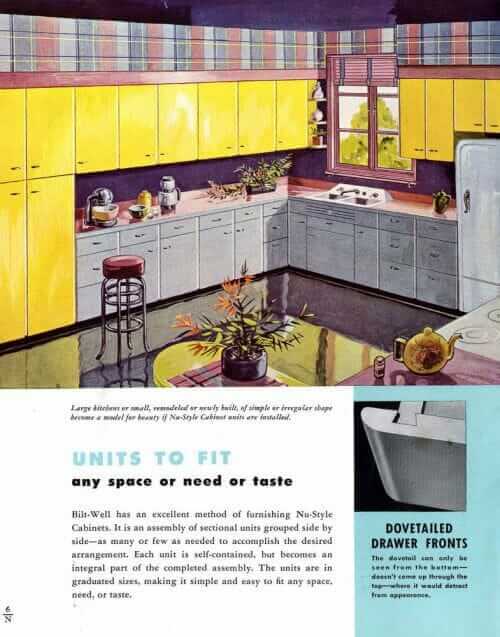 Oh, and don’t forget (1) to order your choice of two optional flour bins and (2) to wallpaper your soffits, ladies! I should have said this in my earlier comment . . . 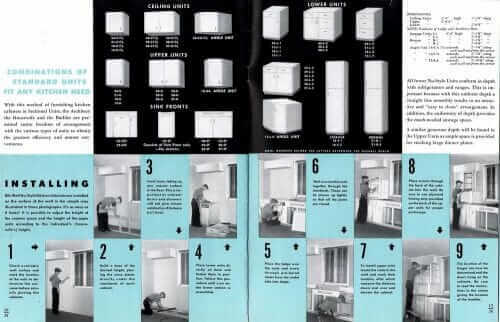 Thank you so much for scanning and posting this brochure. 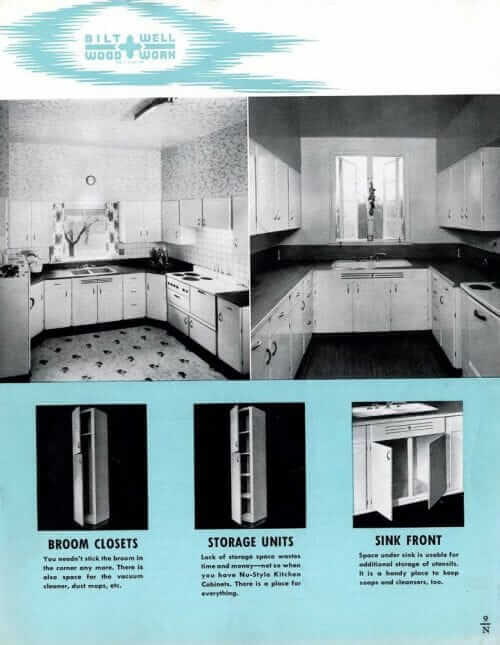 I have printed it out and will keep it with my “house info.” Thank you also for designing the Aqua Ripple laminate. It makes me smile. 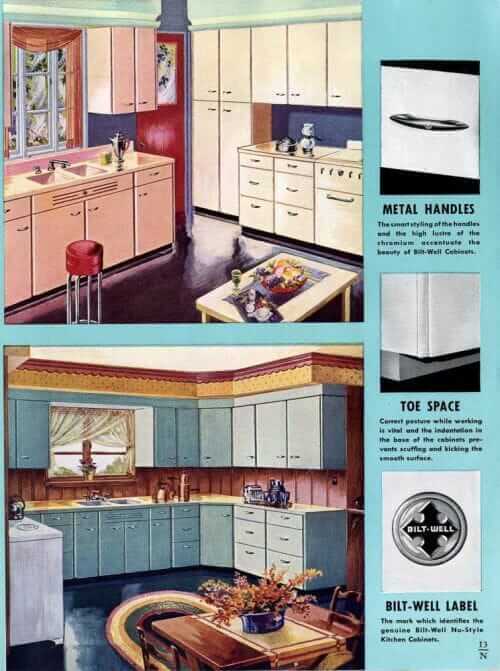 Last week I treated myself to a retro-style aqua toaster and matching electric kettle. Which I didn’t technically “need-need,” but I certainly did need-want them. If you know what I mean! This brochure is amazing. It was so fun to see and I read the entire thing.